There are a few dishes in regular rotation here at Casa P that, honestly, I don’t ever think about sharing with you. It’s not that they’re boring or not good – they wouldn’t be in regular rotation if that was the case! It’s more like I’ve made them so frequently that I forget there was ever a recipe involved. 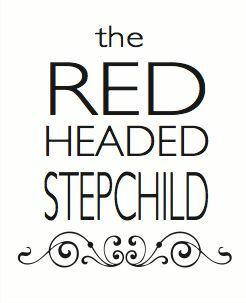 Or in the case of the recipe today, that I spent a few years trying to get it just right. Mr. P and I both enjoy Thai food, and his favorite dish to order at the restaurant is red curry (panang). For whatever reason, it always tasted better at the restaurant, no matter which recipe I tried. So I started making my own Franken-recipe and playing with that, until finally I got to the red curry that I personally think rivals the restaurant’s versions. Is it authentic Thai? Probably not. But it is authentic restaurant Thai? I’d say it’s pretty darn close. Like most curries, the sauce seems to take a lot of ingredients. You’ll need peanut butter, soy sauce, coconut milk, chicken broth (veggie or beef broth works too), red curry paste plus red pepper flakes if you like the extra heat, minced garlic, cilantro, onion, and fish sauce. Most of those are essential; if you don’t have fish sauce and don’t plan to make a lot of Asian-inspired dishes, you can skip it. Unfortunately I’ve never formally measured them out (I’m a visual cook, as in, “that looks right”), so I’m giving you my best guesses. But if your experience is anything like mine, it may still take some tweaking to get it to your liking! At the restaurant, Mr. P usually orders beef panang. Here at home, I make it with chicken, just because it’s easier and cheaper. 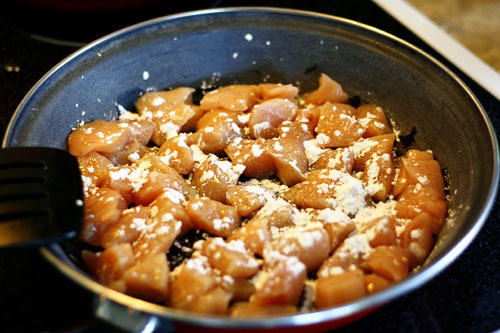 If you go with chicken, start by cutting it into bite-size pieces, then season with salt and pepper and sprinkle with flour/cornstarch. Be sure to coat both sides before turning up the heat! Cook the chicken in a few teaspoons of oil. I use olive or sesame, usually; it’s really there just so the chicken won’t stick more than for flavor. When the pieces are cooked barely all the way through, remove them from the pan and set aside (they’ll keep cooking a bit after you remove them from the heat, so don’t overcook). Now it’s time to make the sauce! 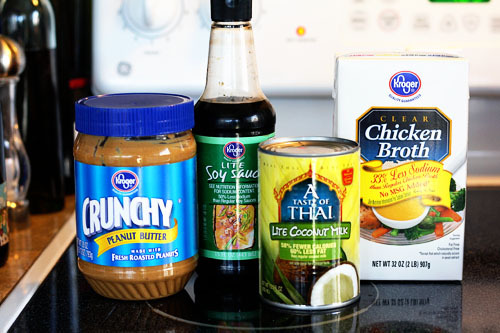 Mix several spoonfuls of peanut butter with a few spoonfuls of curry paste (we get ours at Kroger). You want about a 1/3 cup total of the both of them – I may have been closer to 1/2 cup in this photo, but that’s fine. 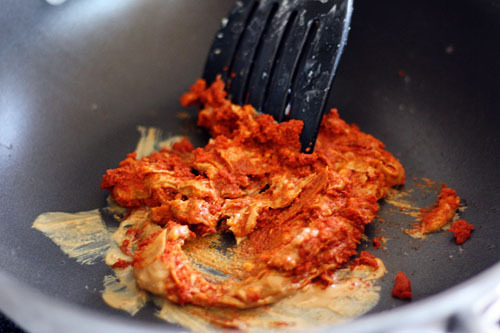 We like a hot curry, so I have an almost 1:1 ratio of peanut butter to paste. 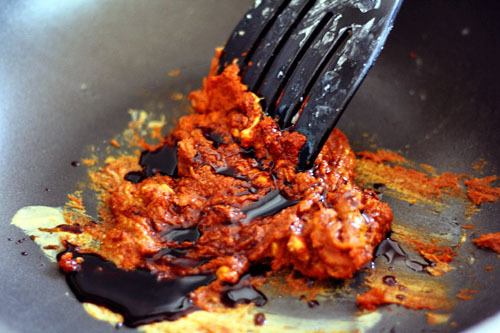 If you aren’t wild about the heat, try using mostly peanut butter with a tablespoon of paste. Mush those together in your skillet (you can use the same skillet you used for the chicken – I changed because I was cooking a few things at once). Heat them over medium-low to medium heat, so the peanut butter gets very soft and but not quite runny. Again, I’m a visual cook, so I’m guessing on the amounts. Adjust to your liking! Next, start to thin out the paste you’ve made with chicken broth. I think I end up using about a half-cup total. I don’t like a curry that’s too milky, so sometimes I don’t add the whole can. I may have this time because I used so much curry paste and peanut butter. Basically, I add milk until the color looks like the curry we get in the restaurant (again with the visuals), which takes from “most of a can” to “a full can”. 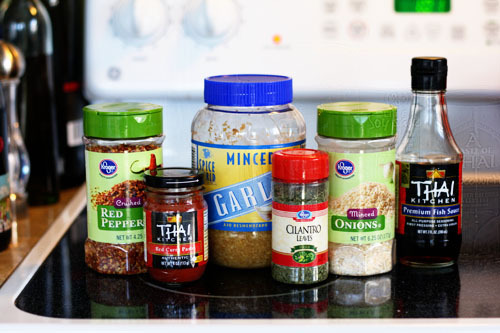 Finally, add the seasonings: dried onion (dice it fresh if you prefer, and cook with peanut butter), crushed red pepper (only if you’ve already burned off all your taste buds like Mr. P), clianto (I use dried), and garlic (I use pre-minced). I suppose I add a one or two tablespoons of each. Sometimes I add these when I add the soy sauce; I don’t think it makes a big difference. Stir it all up, then leave it uncovered to simmer! While it’s simmering, cook your rice if you haven’t already, and prep your veggies. The beef panang that Mr. P orders usually comes with bell peppers as the only veggies. As Mr. P doesn’t like bell peppers, he usually ends up eating around them (which means I get to eat them, yum). 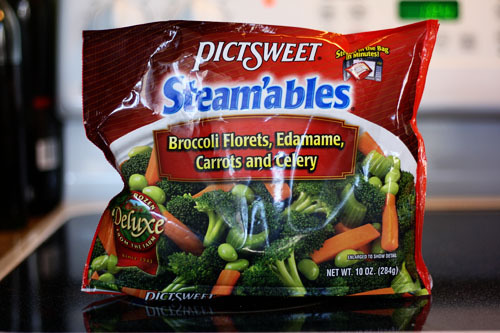 So when I make this at home, I use this frozen veggie blend. If you want to chop up your own veggies, go for it! I know I’ve been all about the visuals – and this looks delicious – but I wish your computer also had smell-o-vision. 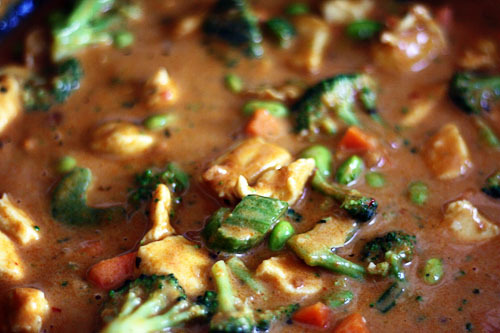 The delicious aroma fills up your kitchen and makes it so hard to let the curry simmer because you want to just eat it! So let it simmer as long as you can... then give up and dig in. The fact that we have this at least once a month, if not more frequently, should be a ringing endorsement enough, right? And while it’s nice to go out to eat where I don’t have to make this myself, I’m so glad that I finally cracked the code of restaurant-style panang. 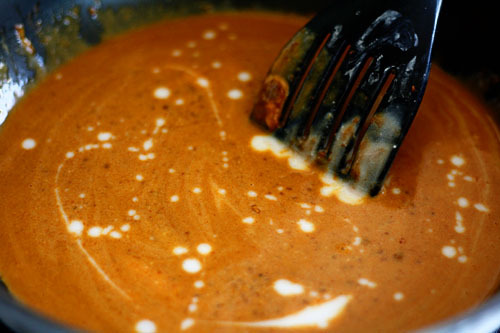 If you give it a try, you can make the curry sauce to whatever heat level you prefer (adjust the paste and red pepper flakes) and with whatever protein and veggies you prefer. Even if it takes you a few tries, I hope that yours is as good as your favorite restaurant curry, too! Sprinkle the chicken with salt, pepper, and cornstarch until nearly cooked through. Remove from heat and set aside to finish cooking. 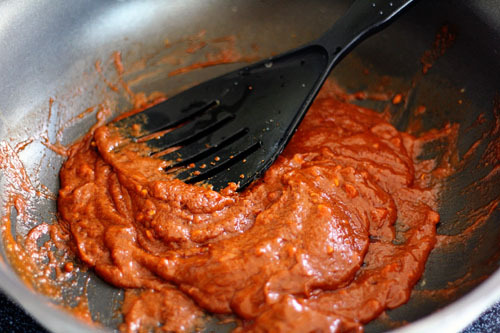 Mix peanut butter and curry paste over medium heat until soft and blended. Mix in soy sauce and fish sauce until combined, then add chicken broth and stir until smooth. 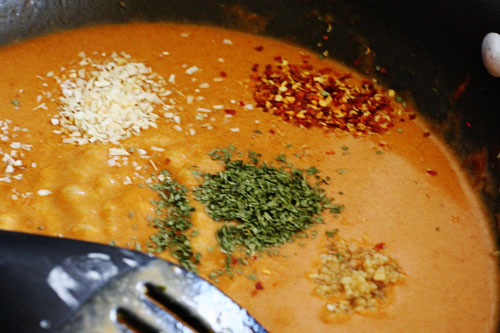 Stir in coconut milk until completely combined, then stir in onion, red pepper, cilantro, and minced garlic. Steam veggies and add to curry sauce with chicken. Let simmer while you cook the rice (at least ten minutes, up to thirty). 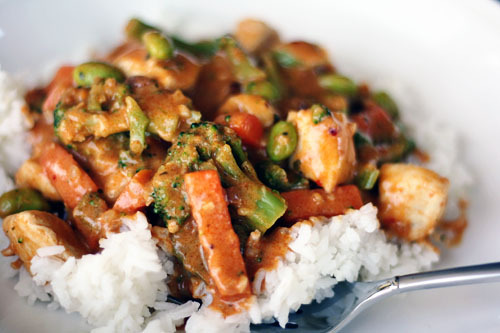 Serve chicken and veggie curry over rice.